What’s wrong with capitalism and what can we do about it? Upon reading the title of this book, I was confused about how Buddhism and Economics could merge together and work with each other. They are very different things yet Vaddhaka Linn has made the two concepts work together in harmony by showing a Buddhist outlook on the economy that we live in today. In his preface, he states that through his book, ‘Buddhism offers a radically alternative perspective to the market fundamentalism that dominates the world today’. That is what he has done and as well as that, it offers people who don’t know much about economics a chance to learn something on the topic. The book is split up into twelve sections, each one going through different ways in which the economy can be changed or looked at through a Buddhist perspective. Linn helps us to understand the fact that there are enough resources for everyone to live comfortably yet modern capitalism prevents that from happening. In the introduction, he begins with what many economists believe to be a pinnacle moment for the economy; the invention of breaking down the production of an item into small segments so that it could be done by many people. However this repetitive action done by the worker can ‘deaden a person’s creativity and their emotions’, thus showing the flaw in this system. What I thought was good about this book was that it didn’t force you to follow Buddhism; rather it was merely an approach to understanding why we have the economy that we do today. For example, as human beings we crave more and want more and the social order of society is not a God-given, therefore it is something that can be controlled and we as people can change the way that social order is done. It is by looking at the needs of others that capitalism can be tamed and changed. 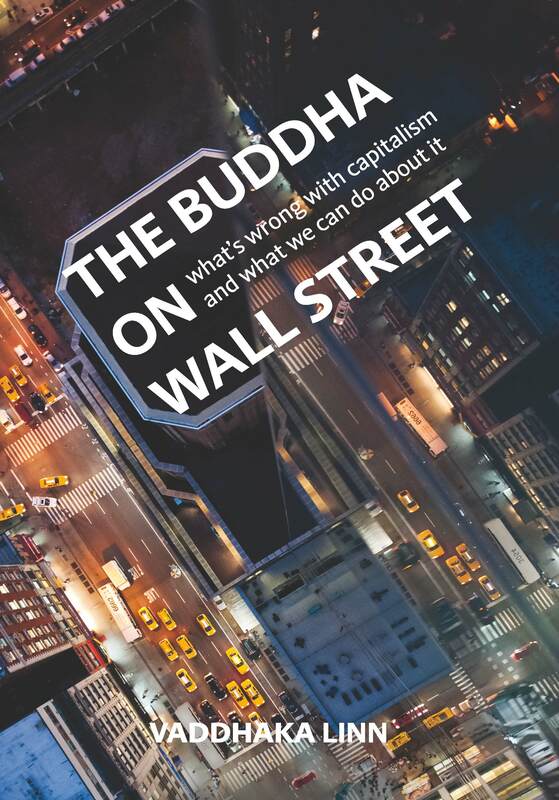 And to show that this is not just about Buddhism, but mainly economics and capitalism, Linn backs up what he says by giving examples of professors and businessmen who express similar thoughts to him. Overall, this book is insightful and carefully goes through the society that we live in through different eyes. Linn explains certain words and what they mean, so that the reader is not alienated and ties it in with the specific topic. By understanding capitalism from the beginning, it is easier to come out of it and live in a way that everyone can survive together. If you’re interested in finding out more, Vaddhaka Linn is coming to Brighton Buddhist Centre on 2nd June. In the meantime, you can buy the book for yourself or find out more from here.